The unprecedented West Coast toxic algal bloom of 2015 appears to be linked to the unusually warm ocean conditions—nicknamed “the blob”—in the winter and spring of that year. The bloom closed fisheries from southern California to northern British Columbia. “We have toxic algae events that result in shellfish closures off the Washington and Oregon coast every three to five years or so, but none of them have been as large as this one,” says lead author Ryan McCabe, a research scientist at the University of Washington’s Joint Institute for the Study of the Atmosphere and Ocean, a collaborative center with National Oceanic and Atmospheric Administration. Researchers found that the 2015 harmful algal bloom, which set records for its spatial extent and the level of toxicity, was dominated by a single species of diatom, Pseudo-nitzschia australis, normally found farther south off California. Warm water not only allowed this species to survive, it also created an environment favoring its growth. By early 2015 the warm “blob” had moved toward shore and spread all along the West Coast. Warmer water creates less dense surface water that is more likely to stay floating on the surface, where it can become depleted in nutrients. 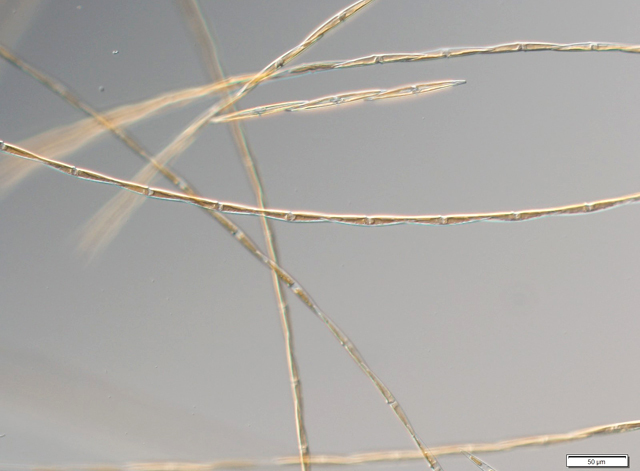 Previous laboratory studies by coauthor William Cochlan of San Francisco State University showed that P. australis can take up nitrogen very quickly from a variety of sources, and appear to outcompete other, nontoxic phytoplankton in nutrient-depleted warm water. For the new study, published in the journal Geophysical Research Letters, researchers performed experiments with P. australis from the 2015 bloom. They showed that when these cells experience warmer temperatures and get more nutrients they can double or triple their cell division rates, allowing them to potentially bloom into a large population fairly quickly at sea. “When springtime shifts in wind direction brought deeper, nutrient-rich water upward near the coast, a small population of P. australis became a big population, which was then washed ashore along the West Coast by late spring storms,” says coauthor Barbara Hickey, professor of oceanography at the University of Washington. This was especially damaging in a year dominated by P. australis. Toxic algae come in many forms, but off the West Coast the major health and economic threat comes from various Pseudo-nitzschia species which can, under certain conditions, produce domoic acid, which can cause gastrointestinal distress, seizures, memory loss, and even death. Toxins can accumulate in razor clams and mussels, making them unsafe for human consumption. But the effects in the ecosystem are more widespread and long-lasting. Shellfish and anchovies containing toxins can get eaten by marine mammals and birds. If toxic algae settle to the ocean floor, they also can get eaten by bottom-dwelling animals like crabs, which then become unsafe to eat. In late May 2015, a sea lion was found convulsing on a Washington beach, and domoic acid was identified in its feces. “That’s something we’d never seen before in Washington, and when we heard this news we knew something huge was going on,” says coauthor Vera Trainer, a research oceanographer at NOAA’s Northwest Fisheries Science Center. That year saw the largest geographic extent of marine mammal impacts ever recorded. A NOAA-led cruise in June 2015 sampled water from southern California up to Vancouver Island, British Columbia. The new study includes those observations, collected near the end of the Washington bloom, as well as other ongoing beach monitoring and water sampling efforts that filter seawater to see the life it contains. Researchers at the Northwest Fisheries Science Center examined the water samples under a high-resolution scanning electron microscope to identify the species present. “As we started getting more and more of the samples that coincided with the peaks in the razor clam toxicity, it was quite clear that P. australis was the dominant species all along the coast,” Trainer says. 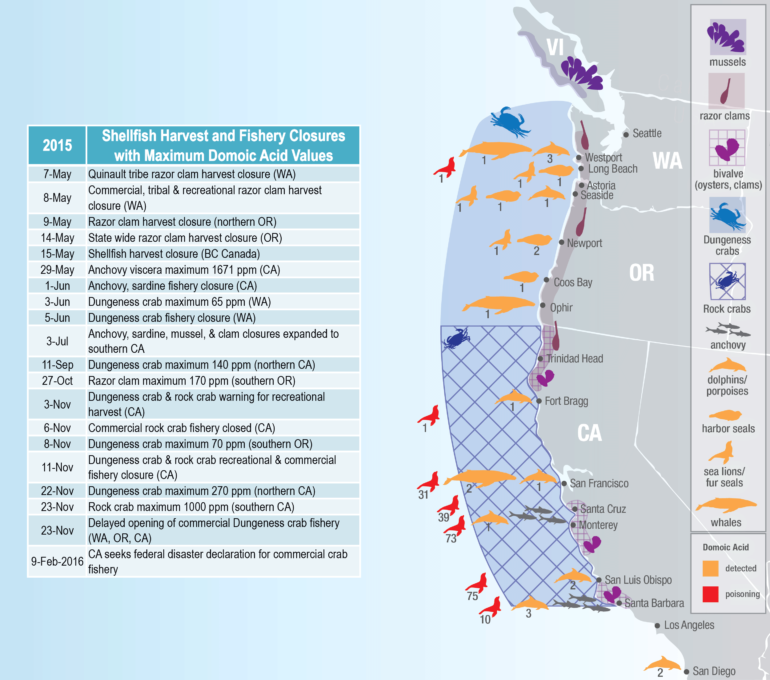 State resource managers have been collecting shellfish to monitor for toxins for decades. Out on the water, samples collected by the Olympic Region Harmful Algal Blooms Partnership and other efforts have also contributed to a 25-year record of toxic algae events. Is blue-green scum turning lakes into toxic pools? The new paper compares the history of toxins in razor clams to indices of ocean climate variability, and finds a connection with El Niño and the longer-term Pacific Decadal Oscillation. Ocean climate cycles could help understand and better predict the emergence of toxic algal blooms. And while the blob was a one-time event that was not due to global warming, it provides a window into what climate change might look like. Other coauthors are from Canada’s Department of Fisheries and Oceans, the Marine Mammal Center in Sausalito, California, and NOAA’s Northwest Fisheries Science Center. The research was primarily funded by NOAA’s National Centers for Coastal Ocean Science’s Center for Sponsored Coastal Ocean Research. Additional funding came from the National Science Foundation, the National Institutes of Health, and COAST through SFSU.